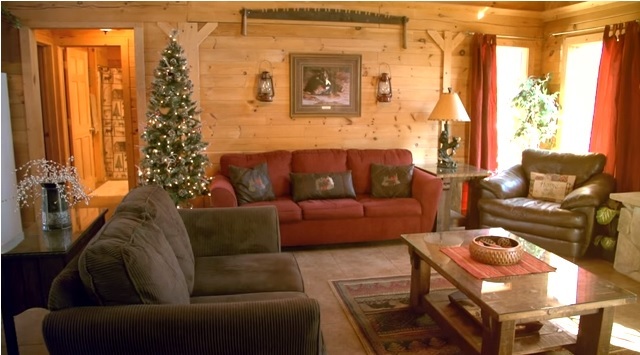 If you want to enjoy a wonderful vacation in Branson this holiday season, you can find always a well decorated log cabin at Thousand Hills Golf Resort to make your Christmas getaway extra special. Christmas cabin in Branson is offered by Thousand Hills to guests who want to spend a warm Christmas Eve with their loved ones. Many of the cabins at Thousand Hills are transformed into Branson Christmas Cabins during the holiday season. These cabins are individually decorated to give you the feeling of home during Christmas time. If you want to celebrate Christmas with the whole family in Branson, you can request a well decorated cabin to make your Christmas vacation a wonderful one. As Christmas shows abound during the holiday season in Branson, many visitors come to this favorite vacation destination in the Midwest to celebrate the season and enjoy a wonderful Christmas Eve with fascinating shows in many entertainment spots in Branson. Christmas in Branson is a great time for visitors and locals alike to enjoy the holiday season. Silver Dollar City and many attractions around town are completely illuminated with dazzling lighting displays during the season, but you don’t realize that when you get back to your cozy log cabin accommodation, you will feel like to continue to celebrate Christmas as the cabin is fully decorated for the holiday season. The log cabins at Thousand Hills are completely decorated during Christmas time to help you and your family feel right at home. These log cabins have fireplaces to help warm you up when it’s cold during the night. This cozy Christmas cabin in Branson has a fully equipped kitchen that includes modern appliances such as refrigerator with ice maker, a microwave, a stove, a dishwasher, pots and pans, and kitchen ware and utensils. With all these great amenities, you will find it convenient and comfortable if you want to cook your own food. Each cabin offers basic amenities such as laundry detergent/drier sheets and dishwashing detergent. During the cold months there is a gas fireplace and the 2 king beds have heated mattress pad for added comfort. The master bedroom features a king sized bed and the master bathroom has a shower, Jacuzzi tub and two sinks. The second bedroom also has a king bed and the bathroom has a double shower. The cabin also has a queen size pull out sofa with a very comfortable foam mattress pad. This cozy cabin accommodation also includes a pack-n-play for use for small children. There’s also a den that features a coloring books for children, along with an assortment of family games and DVDs for use during your stay. Each bedroom of every log cabin has its own tv so everyone is sure to enjoy a great time. Every log cabin has its own front and back porch, both with tables and chairs. Christmas cabin in Branson is a great place to make your Christmas getaway extra special as it is fully decorated during the holiday season.